Just a quick post today to share the first birthday card I worked on this weekend. 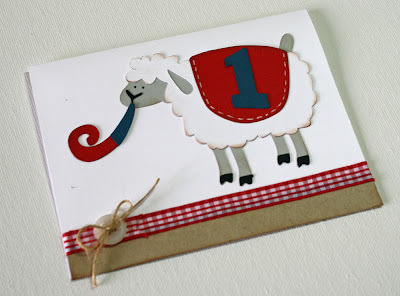 The little lamb is ready to party, and it is customized for a little one's first birthday. I'm submitting this to the Bitten by the Bug 2 Numbers challenge. What a darling card. Love the party sheep. Thanks for sharing with us at BBTB2. I love that lamb, and the card is just precious. Thanks for joining us at BBTB2.